Chicken Piccata Simmered in Lemon Caper Butter Sauce with Pasta. 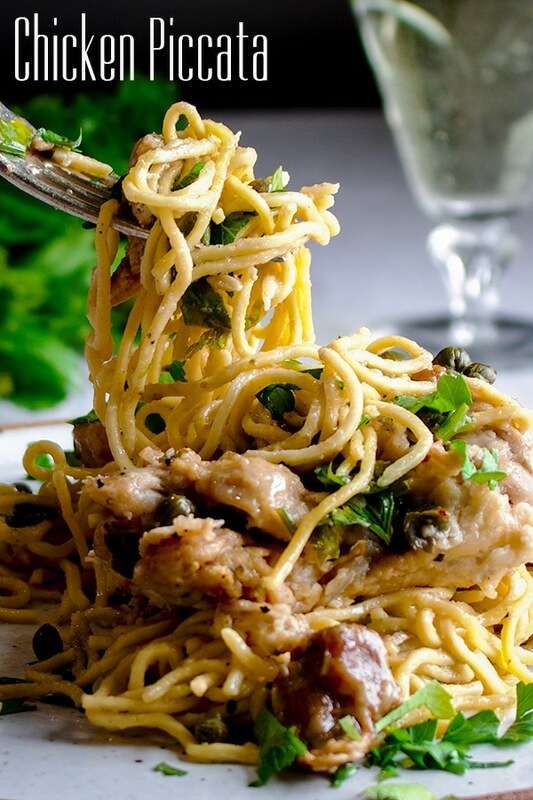 Chicken Piccata is one of those magical dishes that takes very little time (less than 30 minutes) and requires only a handful of ingredients. And, while those qualities make it perfect for quick weeknight suppers, it’s delicious enough to serve to the most discerning dinner party guest. 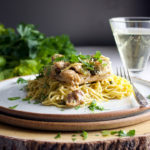 Sauté chicken until golden, let it simmer it in a lemon caper butter sauce and then pour the whole thing over a plate of pasta. Molto delizioso! Cook the pasta according to the package directions until it’s just under al dente (very slightly underdone). Drain and pile it onto a large serving platter. Cover with aluminum foil and place in a 200 degree oven just to keep it warm while you make the chicken. Lay chicken on paper towels and pat dry. Put the flour, salt, and pepper in a shallow dish or pie plate and stir to combine. Dredge the chicken in the flour, coating it on all sides. Gently shake off excess flour and lay the chicken on a plate. Add the olive oil and 2 tbsp butter to a large heavy bottom saucepan or deep skillet and set it over medium-high heat. When the butter is melted, add the chicken. Do not overlap the chicken in the pan – brown in batches if necessary. Let the chicken cook on one side until golden brown – about 3 minutes. Flip over and let cook on the other side util golden brown, about 3 minutes more. Remove the chicken from the pot and set on a plate. Add the vermouth and crushed red pepper to the pan and cook over medium-high heat until almost all the liquid has evaporated – about 5 minutes. Add the lemon juice and chicken broth and bring to a boil. 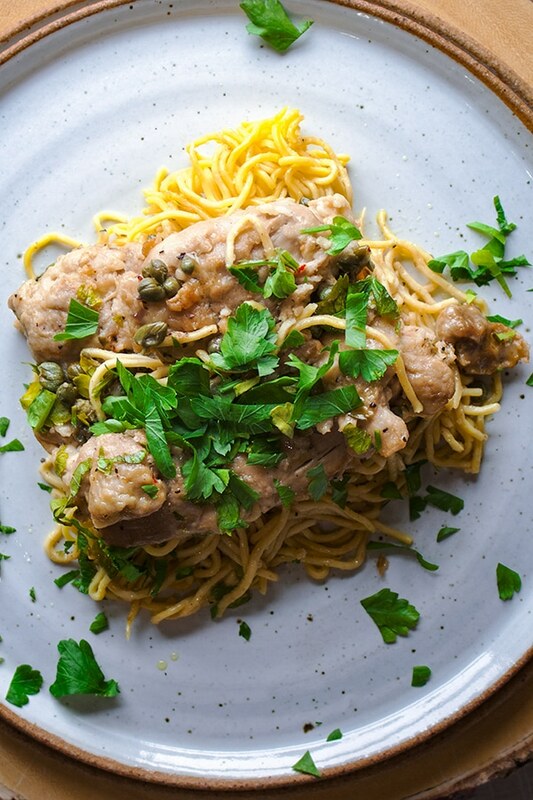 Put the chicken back into the pan along with the capers, reduce the heat to medium-low, cover and let simmer until the chicken is cooked through, about 5-10 minutes. Remove the pan from the heat and taste for seasoning; add more salt and pepper if desired. Use tongs to lay the chicken on top of the pasta. Add the remaining 2 tbsp butter to the pan and stir until it’s melted. 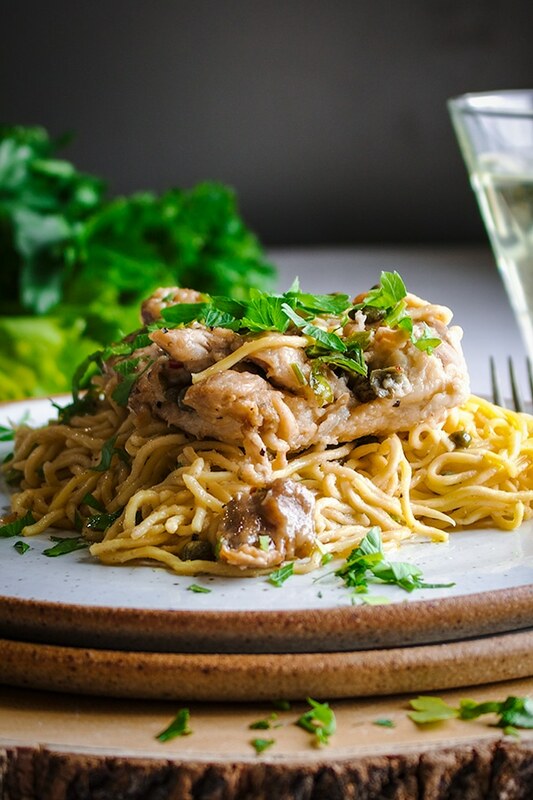 Pour the sauce over the chicken and pasta, top with the chopped parsley, and serve. *If you have the time and inclination, homemade pasta makes this dish even better.